Peace to be upon you. For readers who had follow this blog from the beginning, you probably (or not), remember, my entry on Monalisa painting. 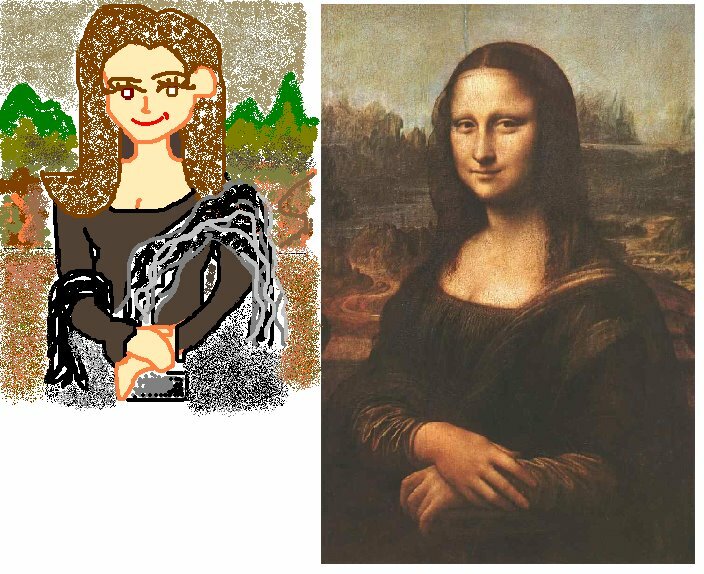 I used MS paint and today, I found a brilliant artwork of Monalisa, also done using MS paint, but way better than my masterpiece. Done by eclecticasylum. Searching for answers to “why”? Peace to be upon you. Lately, I received invitations to write, either on blog or for paper publication. Three invitations in one week. That sounds awesome innit? But hey, do I manage to do all that in one go? One asked me to explain about my religion, another is on my college, and the last is of racism in the UK. Whew. Does 3K words assignment is not enough? Quite weird because before this, my writing in IPBA is not that brilliant. Well, people don’t notice me. My writing is invisible. I am the one who needs language support tutorial class with Dr. Asiah. In IPBA, there are plenty who write better than I do. Plus, their English is better than English people’s English (repetition is unintended). Well you tell me, is my writing that brilliant? So I’ll have confidence to be the next Shirley Geok Lim (?). Oh iya, kawan-kawan saya juga telah menge’tag’ saya. Setakat ini 3 orang. Tahniah! Hutang mereka pun masih belum dilunas. Oh, saya mahu MacBook! My assignment progress: headache. I don’t think they want to do reformation on Malaysian Education System after reading my piece. I bet! Salam. Peace. Hope all of you doing fine. I wish the same thing as well. I’m stuck between my ideas and opinion. I really want to state the fact, but being Malaysia, always being tied to protocols and procedures and legal laws. So, my question is, is it better for me to state the truth or telling them fantasy (or fiction) of Malaysian education system? Great. I only have 48 hours left. SOS! I love ‘comparative education’ module. The module is awesomely inspiring and yet makes me feel intimidated because of my own Malaysian education system. Why? Me, feel inadequate, of Malaysian education system? Honestly, after comparing and learning about other country’s education system, Malaysian education is too idealistic. Far from achievable target. They are running for things that they can’t catch. There’s a Malay proverb which goes “Yang dikejar tak dapat, yang dikendong berciciran”. It means, you can’t get things that you chase, and you are losing things that you carry. Example, we are trying to make younger Malaysian competitive in scientific field, by making them learning Mathematic, Science and Technology subject, in English. That’s not a bad idea though but please, be realistic. There are many whose English proficiency level is below average. Plus, about 2 over 3 primary schools in Malaysia that do not get basic facilities (basic facilities = electricity, phone lines, and clean water). But why on earth we neglect these schools? Meskipun kerajaan telah merwarwarkan Sekolah Bestari selama lebih sedekad, Pelan Induk Pembangunan Pendidikan telah mendedahkan bahawa hampir 20% daripada sekolah-sekolah rendah kita tidak mempunyai bekalan air bersih; hampir 35% tiada makmal komputer; lebih dari satu perlima tiada makmal sains dan satu persepuluh tidak mempunyai bekalan elektrik sempurna. Secara keseluruhannya, lebih dua pertiga sekolah rendah tidak mempunyai kemudahan yang lengkap. Ini merupakan tambahan kepada pendedahan YB Dr. Wan Azizah Wan Ismail di dalam suratnya kepada Menteri Pelajaran bertarikh 13 Disember 2006 bahawa peratusan perbelanjaan pendidikan kita ketinggalan berbanding Senegal, Malawi dan Kenya di samping kita tergolong di kalangan 24 negara termasuk Palestin dan Maldive yang menghadapi kemerosotan enrolmen sekolah rendah antara 1999 hingga 2004. Imagine, that God make you born in rural area and experience difficulties in getting necessities. Just imagine. Imagine their fate is yours. So, how on earth you want them to learn science, math and english, plus technology? Even necessities is far from their imagination. I would say, the money should go to these people, because they have rights to get decent education. We want to develop Malaysia, but we don’t develop the people. So who are going to continue the legacy later? So before we develop the country, develop the human resource first, make them love Malaysia, don’t lose Malaysian elites to the developed country (US, UK, Singapore, etc). US and UK achievement is better, although they don’t have bombastic policy and national education of philosophy. Obviously because they target what they can achieve and develop the people who can develop the country. PS: Er, can I use this piece for my assignment? Assalamualaikum. Whew. Time flies, really fast. British Summer Time is going to take place this midnight, so we’re going to lose an hour. Argh! I really need to buckle up for my assignment. Pray for me. May Allah bless rahma on you guys. Interesting to show to you guys: Email+Y! Messenger. Don’t know whether you’ve realise it but it’s a cool thing. Yahoo Email Beta allows you to check new email every 10 minutes, yet receive messages from your friends at the same time. (I have loads thing to comment and tell but can’t write too mush as my assignment also need to be written =p). Here how it looks like. Cool huh? Most reasonable conversation, with master. ainee: that’s a lie isnt it? me master: it’s merely a myth to comfort your feeling. me master: i had too much of it. We went miles for someone whom we think worth for. We even do things that is beyond our limitation. Even do something that we can’t imagine. But actually in the end, it’s frustating. So I learned that, you can’t fake your feelings. Learn to forgive, but never to forget. Because we, human, learn from mistakes. The question is; have we ever learn from our mistakes? So people, do remind me of my doings. Remind me to do my assignment. Inspire me! malas, but have to. hwargh! last creative writing session. ganbatte!